I never shared these baby gifts I made a while back. I'm not sure if there's anything more fun to sew than baby gifts. So tiny, so cute, and actually useful. 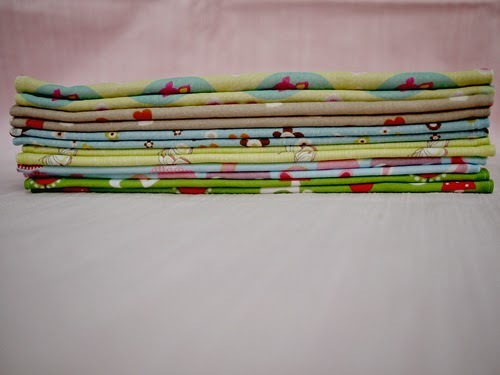 I hope I will never run out of babies to sew for. 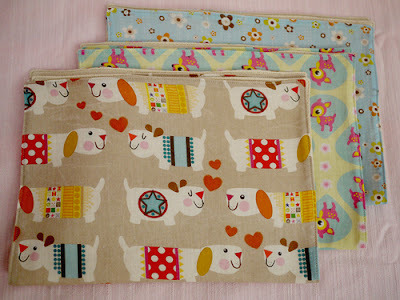 First, another round of voile burp cloths made from fun Spoonflower fabrics. The first round were so well received as gifts that I couldn't help but make more. 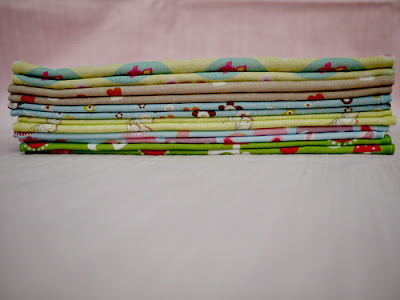 And once I figured out the key to pressing the voile (as described in my previous post), they came together quickly. 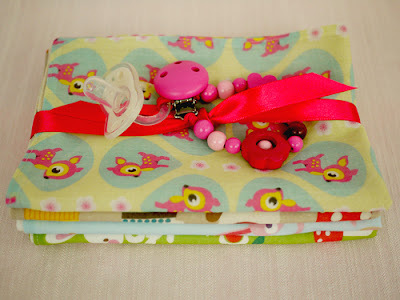 Don't these make a nice gift bundle when packaged with a handmade pacifier keeper? I've talked about my pacifier chains before. I know it may seem crazy to give a baby gift of beads. I realize parents may not feel comfortable with it, and that's okay. But I'm confident in their safety. I buy wood clips and beads from Hobby Fun House in Denmark, and everything is nontoxic, lead free, and meets European safety standards. I use industrial strength nylon cord, and I double string and double knot everything. 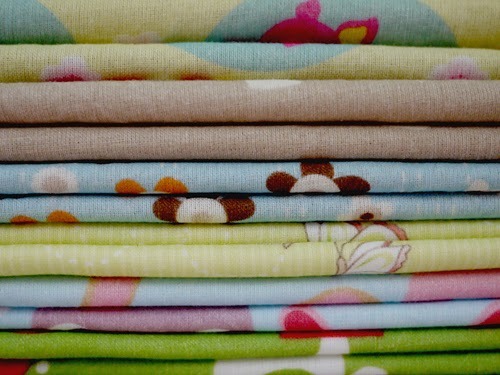 Next, some bibs. I'm pretty sure I used the free Liberty Bib pattern from Purl Soho. I added a second fabric to the bottom part of the bib, and stamped some twill tape to make personalized tags. 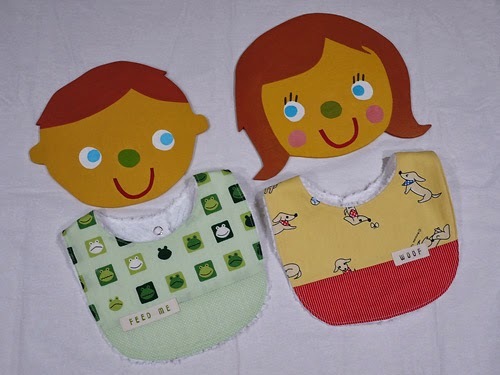 It's a bit hard to see, but the frog bib says "FEED ME," and the dog bib says "WOOF." 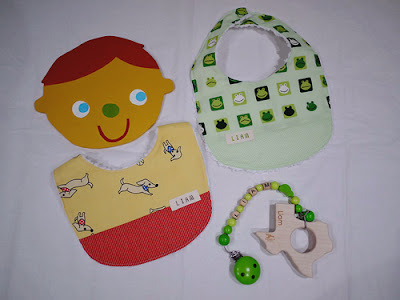 I personalized a set for a sweet little Liam and included a personalized pacifier chain and Texas teether. 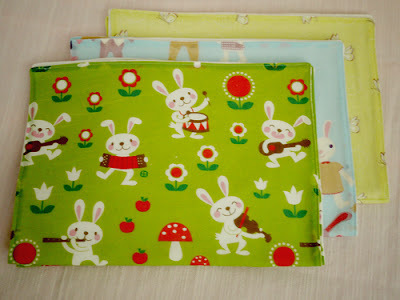 By the way, aren't my new models by Herman Marie as cute as can be? They make me smile from ear to ear. 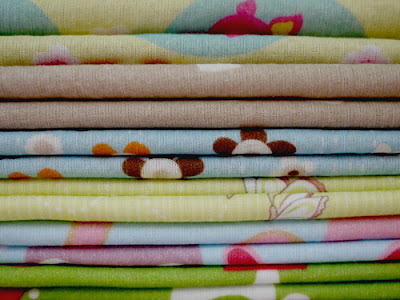 I'm brainstorming about how I might incorporate them onto some hangers for showing baby clothes.